Coat bottom of a dutch oven with olive oils. Saute onions and peppers over medium high heat until just soft. Add the rest of the ingredients, cover, and place in a 350 degree oven for one hour. 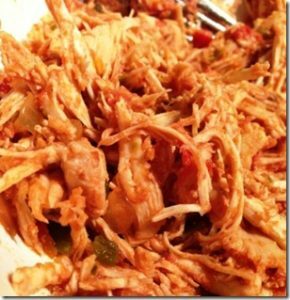 Remove chicken and shred with two forks and add back to the pot. Stir and serve. This entry was posted in Detox Recipe, Recipes on April 12, 2015 by Jules. Brenda Edin on Labor Day Picnic? Try a Slow Food USA Eat-In in Your Neighborhood.